Get creative with the ultimate in compact performance. 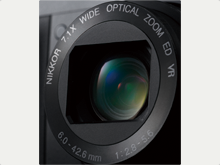 Imaging excellence and maximum creative freedom is a precision wide-angle 7.1x zoom, NIKKOR lens that incorporates two ED glass elements and covers a broad 28-200mm focal range. * A built-in ND (neutral density) filter expands exposure selection range for greater creative possibilities. The COOLPIX P7000 features a large 1/1.7-in. type CCD imaging sensor engineered to perform brilliantly. Maximizing its achievable levels of high resolution, fine detail and high image quality is processing power based on Nikon's comprehensive EXPEED C2 Image Processing Engine. 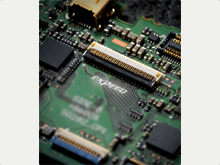 These optimized technologies also ensure system performance on the highest level. 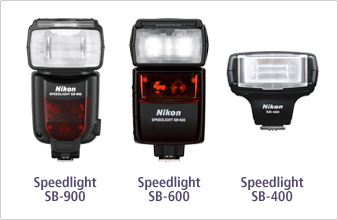 Light sensitivity settings as high as ISO 6400 help achieve sharper, more natural-looking photos in a variety of low lighting situations, or when shooting fast-moving subjects. The COOLPIX P7000 is capable of shooting full-size images (3648 x 2736) at ISO 6400 when using its new Hi 1 setting. Low noise night mode lets you take beautiful handheld pictures at night, or in locations with extremely low lighting. It does this by minimizing noise at high ISO, even though its combining output from multiple pixels limits the image size to render optimized results. * Setting is available only for image size of 3M (2048 x 1536) or smaller. Zoom Memory lets you quickly switch between seven preset focal lengths as though you were choosing instantly between one of seven different prime lenses. You can preset up to three different profiles for favorite focal length and camera settings, and then switch between these settings at the touch of a button. Two varieties of AE bracketing join White Balance bracketing to help achieve the best possible results when you want fine control over these settings. Use bracketing to capture a consecutive series of shots with incrementally changed settings at each press of the shutter, judge the results, and proceed as best fits your shooting style. AE (Tv) bracketing adjusts only shutter speed, while AE (Sv) bracketing offers new creative possibilities by adjusting only the ISO sensitivity. 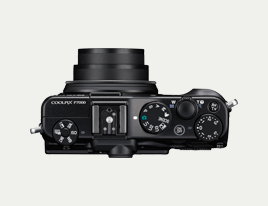 Newly designed for the photographer who wants quick and sure control over the COOLPIX P7000's versatile functions, the independent Quick menu dial provides fast access to ISO, white balance, image quality, bracketing, Tone level information and my menu. There is also an independent Exposure Compensation dial that provides direct control up to ±3 EV compensation in 1/3 EV steps. The COOLPIX P7000 is engineered to keep you ahead of the action by making fast work of settings and ensuring the all-round high-speed operation you need to capture decisive moments and beautifully preserve once-in-a-lifetime expressions. Ensuring a clear view during shooting　and playback is a 7.5cm(3-in. ), 921k-dot high-resolution TFT LCD monitor that employs Nikon's Clear Color Display technology and is capable of reproducing roughly 100% of the sRGB color space. Also present is an optical viewfinder with diopter adjustment. This powerful creative tool helps advanced users as well as novices achieve the results they seek. Its display lets you easily confirm tone levels for any point within the framed image, and from there make fine adjustments to exposure compensation, aperture, shutter speed or even ISO settings. Note：Information displayed on the actual camera differs from that shown above. Display the Virtual Horizon indicator on the LCD for real-time visual feedback that lets you confirm whether the camera is level relative to the horizontal plane, and also confirm horizontal inclination. The COOLPIX P7000 goes beyond the already outstanding noise reduction performance offered on other cameras in the lineup by adding a new "Low" setting that is effective when you wish to place priority on yet greater clarity or reproduction of fine detail. 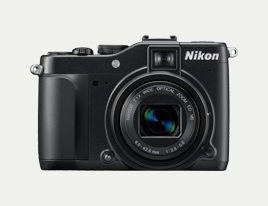 A new evolution of NRW for the COOLPIX P7000 offers compatibility with advanced Nikon camera features that make the format more useful and flexible. Included are features such as continuous shooting, Picture Control, distortion compensation, D-Lighting, and in-camera RAW processing. 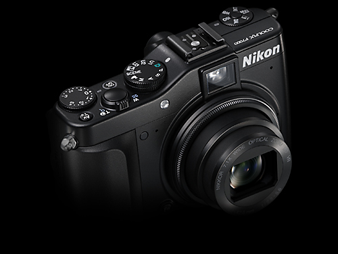 Nikon's own NRW (RAW) file format contains the original image information read by the CCD image sensor for each shot. This permanent record of the unprocessed data lets you modify and edit the image freely without worrying about any degradation in image quality. You can also opt to have the camera process the RAW data any time and save the adjusted results as a separate JPEG file. 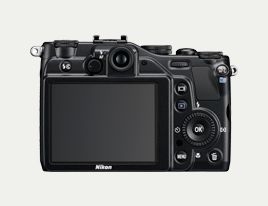 Alternatively, you can process the RAW data using Nikon's Capture NX 2 (Ver. 2.2.5) or ViewNX (Ver. 2.0.1) software applications for PC and Macintosh computers. Record HD movies at 720p (1280 x 720, 24 fps) with stereo sound, whether using the built-in microphone or taking advantage of built-in support for powered external microphones. 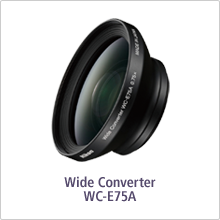 The optional WC-E75A wide-angle converter lens lets you broaden focal range on the wide end to 21mm (35mm format equivalent), breadth that serves as a boon to creative expression when shooting architecture or landscapes. Note: The UR-E22 Adapter Ring is required for using the WC-E75A wide-angle converter lens, and zoom cannot be used while the converter lens is mounted. * The SB-400 is not compatible with Advanced Wireless Lighting. 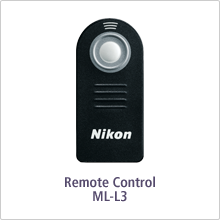 The Wireless Remote Control ML-L3 communicates with sensors on both the front and back of the COOLPIX P7000 to enable remote shutter release, providing necessary camera stability when using long exposures, such as for landscape and macro photography.